This title will be released on April 13, 2004. 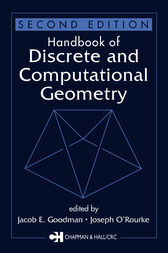 While high-quality books and journals in this field continue to proliferate, none has yet come close to matching the Handbook of Discrete and Computational Geometry, which in its first edition, quickly became the definitive reference work in its field. But with the rapid growth of the discipline and the many advances made over the past seven years, it's time to bring this standard-setting reference up to date. Editors Jacob E. Goodman and Joseph O'Rourke reassembled their stellar panel of contributors, added manymore, and together thoroughly revised their work to make the most important results and methods, both classic and cutting-edge, accessible in one convenient volume. Now over more then 1500 pages, the Handbook of Discrete and Computational Geometry, Second Edition once again provides unparalleled, authoritative coverage of theory, methods, and applications.